HMS Hood circa 1931-1932. Note the Fairey IIIF seaplane on her quarterdeck catapult. This proved to be a very unreliable arrangement and was ultimately removed. HMS Hood, a 42,100-ton battlecruiser built at Clydebank, Scotland, was completed in March 1920. For more than two decades, she was the World's largest warship and, with her long, low hull and finely balanced silhouette, was to many the embodiment of "big-gun" era seapower. During her travels in European waters and far away, Hood actively represented Great Britain throughout her career. Her first cruise, in 1920, was to Scandanavia. The next year she went down to Gibraltar and Spain and in 1922 visited Brazil and the West Indies. 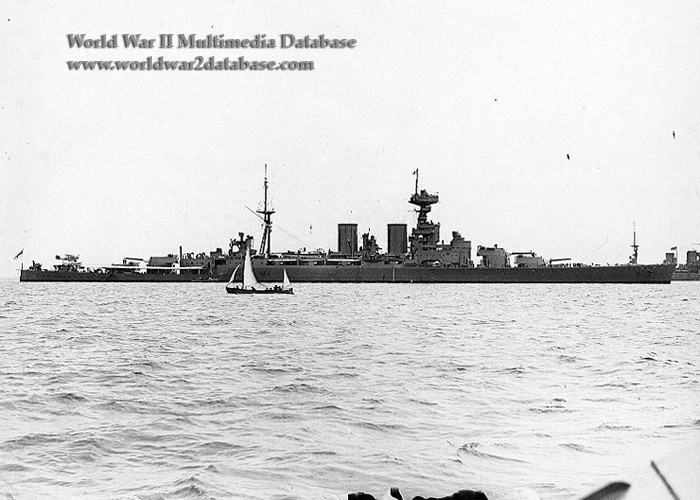 After a brief call on Denmark and Norway in 1923, Hood was flagship on a eleven-month cruise around the World, accompanied by the smaller battlecruiser Repulse and a number of light cruisers. In 1925, she called on Lisbon to help commemorate Portugal's contributions to navigation and exploration. For ten years after 1925, Hood was assigned to the Royal Navy's Home and Atlantic Fleets, operating primarily around Europe, with a visit to the West Indies in 1932. She served with the Mediterranean Fleet in 1936-39, protecting British interests during the Spanish Civil War. Back with the Home Fleet after mid-1939, Hood operated in the North Atlantic and North Sea through the first part of World War II and received minor damage in a German air attack on September 26, 1939, an event that demonstrated the relative ineffectiveness of contemporary anti-aircraft gunfire. In June and July 1940, the battlecruiser was in the Mediterranean area. She was flagship during the July 3 Mers-el-Kebir battle, the most dramatic and destructive of several incidents in which the British Navy seized, interned, destroyed or attempted to destroy the warships of their recent ally, France. These acts were undertaken on Government orders to allay fears that the French Navy might fall into German hands. Hood spent the remainder of her service operating from Scapa Flow, covering the North Sea and Atlantic from the threat of German surface raiders. She was now elderly, overloaded, and burdened with an inadequate armoring arrangement. However, her great operational value had acted through the 1930s to prevent the Royal Navy from taking her out of service for a badly-needed modernization, and now it was too late. In May 1941, in company with the new battleship Prince of Wales, she was sent out to search for the German battleship Bismarck, which had left Norway for the Atlantic. On the morning of May 24, the two British capital ships found the enemy to the west of Iceland. In the resulting Battle of the Denmark Strait, one or more of Bismarck's fifteen-inch shells got into Hood's after magazines. They erupted in a massive explosion. The great ship sank in moments with all but three of her large crew, an event that shocked the Royal Navy, the British nation and the entire World. HMS Hood's remains were located and photographed by a British deep sea expedition in July 2001.